It all started in the late 1950’s in the living room of Doug and Dot MacLeod. A group of Lutherans from Westborough and the surrounding area wanted a Lutheran church here. Someone knew Pastor Albers, the mission executive of the Atlantic District of the Lutheran Church–Missouri Synod. So they started lobbying him for a new congregation. In April, 1959, the Rev. Frederick Puelle arrived to start canvassing the neighborhood. On January 17, 1960, Good Shepherd held our first worship services. We met in the Forbes Community House. Eighty-four people came! The very next Sunday, we started our first Sunday School classes with 30 children! Clearly, we were off to a good start. GSLC starts it’s Sunday school with 30 Children 1 week after 1st Service is held. The years since then have been full of growth, new ministries, and the changes that accompany a vibrant congregation. 1967-1968 – Our first building included worship/multipurpose space, 8 classrooms, an office, and a small kitchen. 1989-1990 – This time we added a new sanctuary, a nursery, an expanded kitchen, and a basement under the sanctuary that became more classroom space and a youth room. 2004-2005 – Our most recent project added a second floor for more educational space, a bell choir loft, and a real Steeple! As you can see, Good Shepherd has lots of children, youth, and families that need space to grow and learn. In 1976, the congregation went through a big change. 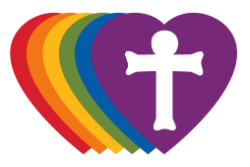 As the Lutheran Church-Missouri Synod became more conservative, Good Shepherd felt the need to be more welcoming to a wider variety of people. We left the LC-MS and are now members of the Evangelical Lutheran Church in America. We are thrilled to welcome people of all ages, races, ethnicity, economic categories, marital status, gender and orientations. Everyone is welcome at our Lord’s Table. Our Worship has also seen growth and change. In 1996, we added a Contemporary service in addition to our traditional worship services on Sunday morning. The Contemporary service is supported by our Praise Team, called New Direction. Led by vocalists, keyboard, guitars, drums and a wonderful variety of other instruments, this service is less formal and uses contemporary music to praise God. In 2010, we added Wednesday night services. This worship uses a variety of newer styles of liturgy including an evening Eucharist called Unfailing Light, Taize Evening Prayer, a Service of Healing, and Prayer Around the Cross. These quiet, contemplative services are supplemented by special services for specific times in the church year. There have been many other changes and additions over the years. There are many ways to serve and reach out to our community here and all over the world. We have changed from mostly young families to recently adding a group for Seniors called Older Wiser Lutherans (OWLs). Our youth groups have expanded. Our Music program has grown in so many ways with vocal, handbell, and instrumental choirs for all ages. Our membership has grown from under 100 people to well over 700. We are growing disciples committed to “growing, nurturing, and making disciples in Christ.” Come see what lies in store for us in God’s future.